If you need more information about accessing resources when off-campus, please take a look at our newest LibGuide. Have any questions about this or any other Library resources? Please contact us. 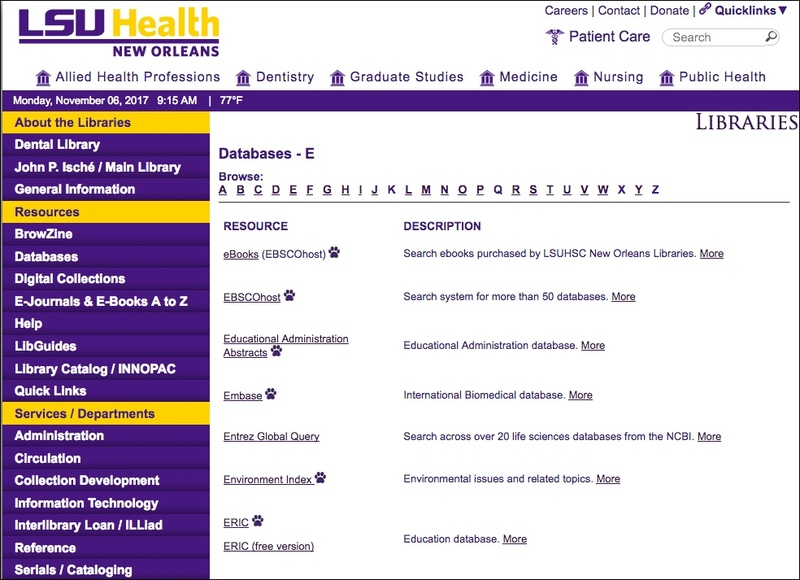 This summer the LSU Health Sciences Center Library upgraded from DynaMed, a clinical information resource to DynaMed Plus. The new, visually appealing database offers information in bullet points, topic overviews on drugs, diseases, and therapies. Due to the ease of the resource, it is often compared to UpToDate. Topics included in the user interface update daily. Operators automatically receive practice changing updates. The amazing tool links to 2,500 full-text articles; handlers get answers quickly and efficiently. Most importantly, consumers can easily download the DynaMed Plus app to use on their phones or tablets. Tags: Campus News, Databases, Dynamed, LCS | E-Resource News | Permalink | Comments Off on DynaMed Plus | Posted Monday, July 31, 2017 by Spradley, Lori C.
More Nursing and Allied Health Journals Available via CINAHL Complete! The Library is pleased to announce that we now have CINAHL Complete! CINAHL Complete is EBSCOÔÇÖs most comprehensive access point for full-text nursing and allied health literature. It replaces CINAHL Plus with Full Text, but donÔÇÖt worry, you wonÔÇÖt have to learn how to use a new product; the look and functionality are the same. What is different is that now there are more?áfull-text journals?áand indexed titles. ?á “How many?ámore?” you ask! ?á Well,?áthere are over 550?ámore?áfull-text journals and over 150 additional indexed journals. ?á In all, CINAHL Complete includes access to over 1,300 full-text journals and includes indexing for over 5,400 journals. Our subscription also includes over 130 Evidence-Based Care Sheets, 170 Continuing Education Modules, and more. 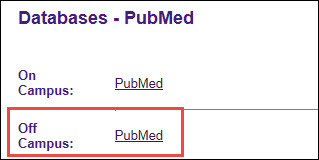 To see a complete list of journals available, you can click on ÔÇ£PublicationsÔÇØ at the top of the CINAHL Complete screen. Remember, many of the core journals are listed in the library catalog, INNOPAC, and you can link directly to a journal?áand browse available issues from there, too. ?á And all these journals are listed in our EBSCO A to Z list. For further assistance searching CINAHL Complete, contact a reference librarian on duty. The LSUHSC Libraries support Dynamed, a point of care database that provides the best available evidence to support clinical decision-making. ?á DynaMed is?áa comparable product to UpToDate and much more affordable. While the?áLSUHSC New Orleans Libraries were never involved in the UpToDate subscription and had no access, we are hearing that it is no longer available from various hospital websites. We suggest you try DynaMed as the alternative. Our next installment of 2 Minute Tips reveals the steps to access a database like PubMed or CINAHLplus with full text when you are off campus. 2 Minute tips is a blog series where we bring you short video tutorials on various tools and resources in the library. RefWorks your web-based reference manager is getting a new look. If you have already created Refworks personal databases, please convert to the RefWorks 2.0 as soon as possible and take advantage of the cleaner, more intuitive interface. Not familiar with Refworks? Create a new log-in (free) and begin managing your references with RefWorks 2.0. RefWorks 2.0 allows you to manage your references anywhere you have access to the Internet! Try the RefWorks 2.0 tutorial to get a glimpse of what you can do to get organized. For more information about RefWorks 2.0 and other super cool ways to gather your references including searching SCOPUS and directly exporting citations to your RefWorks account contact Kathy Kerdolff. To switch between old and new versions, simply use the links at the top right of the screen. RefWorks 1.0 will be available through December 2011. Rehabilitation Reference Center is a wide-ranging collection of evidence-based rehabilitation resources for rehabilitation clinicians, physical therapists and occupational therapists to personalize and print at the point-of-care. Users can locate information by doing a simply keyword search or by browsing through pre-determined topics such as ÔÇ£Diseases & Conditions,ÔÇØ ÔÇ£Drug Information,ÔÇØ ÔÇ£Patient Education,ÔÇØ ÔÇ£Exercise ImagesÔÇØ and ÔÇ£Practice Resources.ÔÇØ Users will also find Key Features and up-to-date Health News from on the homepage. LSUHSC faculty, staff and students can access RCC off campus with use of a valid LSUHSC library barcode & PIN. You can find a link to this resource from the LibraryÔÇÖs Online Resource page. The LSUHSC Libraries provide access to Exam Master, an online resource that helps students prepare for exams. Exam Master includes USMLE and NBDE practice tests, as well as medical subject reviews. First time users must create an Exam Master username and password. Username is your lsuhsc email address. Password is one you create.